Ahoy all you good rats out there. Tonight I’m writing a most exciting entry. As many of you know I’ve been working hard at the salon taking on some really exciting projects. Sure they’re technical and require focus and quick thinking. But there’s another side to working the chair. The most important side. Taking care of our guests. I know I talk a lot about the role of service and how important it is to me. Yet without it, my job as your stylist is pretty empty. Many of my guests are close friends of mine and visiting me for a session in the shop is an extension of what we do together. Yet, so many of the people I serve come in as total strangers. And I have a limited time to become someone familiar and trusted to them. Isn’t that a bit unsettling when you think about it? One of the biggest critiques of salons and stylists I hear is that the impersonal and cold treatment really spoiled the experience for many. My good friend Paul always affirms that a solid product is based in the even richer and greater experience surrounding the product…no matter what the product may be. And you know what? He’s right. There’s no replacing a bad experience. And there is no reason for me to ever give anything but the most attentive and authentic experience I can. 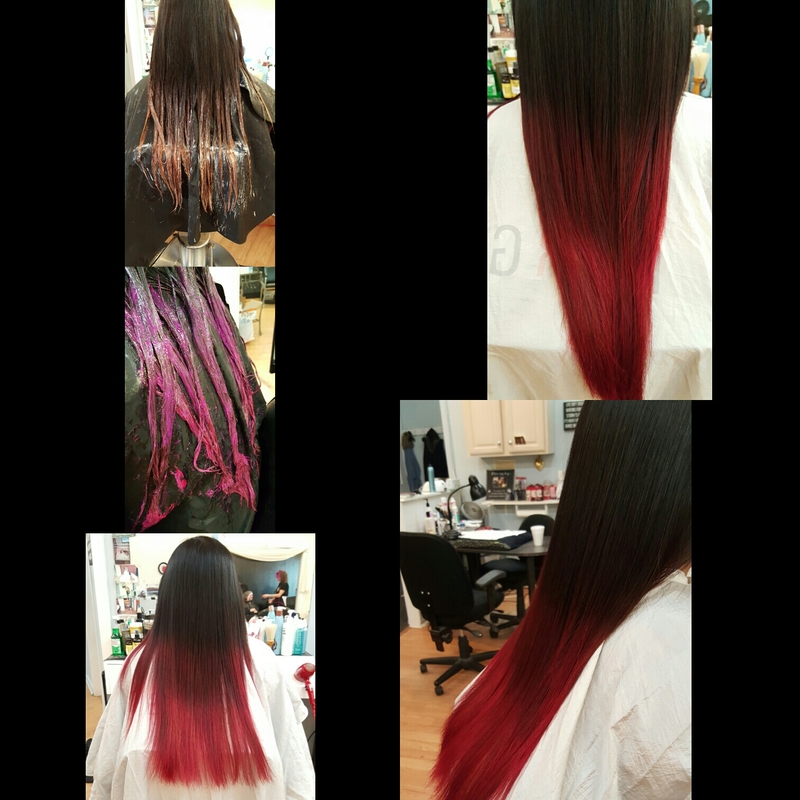 With that being said, I want to tell a story about the red ombre you see above. Jules came to me for her hair color by referral from one of my most treasured people ever, Cassie. Jules drove for many miles for me specifically to color her hair. When meeting her for the first time, I had to not only provide the final results of vibrant color and professional hair health….but I had to provide the most critical piece of making sure Jules felt at ease and excited about her visit. Since fashion color work ranges between. 3-6 hours in the salon. That’s a long time to spend with a brand new person, especially one performing intricate levels of hair chemistry on one’s scalp. Like a good coach, the stylist must know which stories to tell and which questions to ask to help build rapport and trust…..as written in such sterile language in every cosmetology textbook. To me….it goes beyond that. Sitting down with me for your session means sitting down with the best version of myself that I can offer. Hair Forever is my house and when you visit me, I want you to feel at home. I want you to see your place in the tradition and history of Hair Forever. The process of getting to know each guest is one of my favorite parts of what I do. The role of stylist truly is hanging out with your friends and creating meaningful and beautiful art together. I take my time and craft your hair magic because I care more about the person than I do the procedure. I never rush because while you’re on my time, I aim to give you all of my time. You sit with me and we create together. I was never the fastest stylist but I’d like to think I’m the one you can relax with. I love what I do and I love each and every chance I get to connect with you.